I recently got a call from a friend who had rung me after hearing of the death of a friend of his. He called me, not because I knew the person, but because, as he said, ‘You’re good with this kind of thing’. My feeling is that this is because I don’t believe that death is the end of us and I have good reasons for that belief. I’ve done hundreds of Past Life Regressions with clients, and also experienced quite a few myself, mostly when I was training in Regression Therapy but also whilst mentoring other Regression Therapists and working with peers. There are so many similarities in the experiences that I cannot put it down to imagination, but not necessarily the similarities you might imagine. One thing I’ve noticed is that our religious beliefs, and also our age, play a large part in how we experience death and crossing in to the ‘spirit realms’. 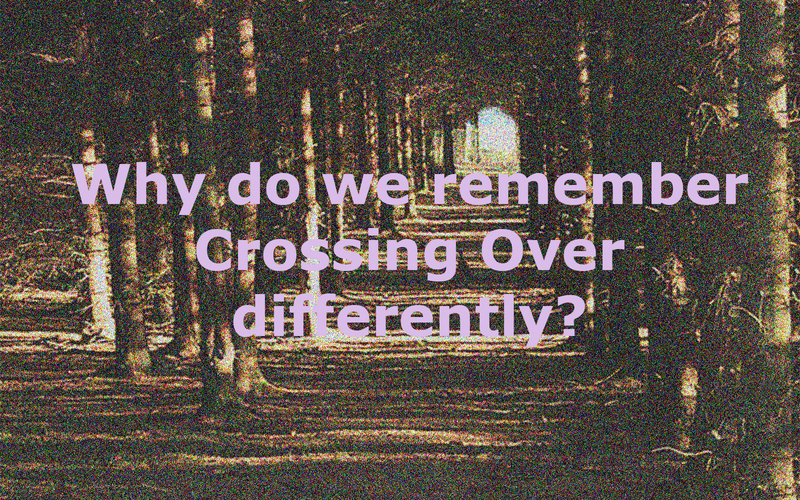 It is extremely difficult to describe, understand or explain (to ourselves as much as to anyone else) the experience of crossing over, and even more difficult to describe what we find when we do. But also, I think we experience it differently because each of us is different and perfection, in our ego state of humanity, is different for each of us. There are the many religious writings that try to explain, or guide us through, this crossing, from the Egyptian Book of the Dead, the Tibetan Book of the Dead to the Bible. The thing we have to remember is that each one is trying relate the experience with the language, knowledge and understanding of their place and time. This is where my experience of working with Past Life Regressions, and particularly crossing over, becomes really telling. Whereas many people describe ‘the Light’, and someone coming to meet them, whether this is a relative or friend, a spirit guide, and angel or a saint, others describe feeling sucked into a tunnel and inextricably drawn towards the light. Some describe feeling lifted upwards and layers of ‘weight’ peeling off them, still others just find themselves, instantly, in another realm. Generally these descriptions are related to what they have learnt or been told about death and the crossing over. Even if you are not religious you will have a cultural story that is indoctrinated into your psyche. My understanding is that you will remember it in whatever way makes it feel safe for you. When we remember these things in our living body we translate them into something that we can understand. So where is the similarity? If this is real would we not all have the same experience? From the point of view of religion this may be true but from the point of view of science, and in particular the science of memory, this makes total sense. Memory is not saved like a video recording but we extract from it the meaning and store it in a way that makes most sense to us. We fit it into ‘schemas’, ways of categorising information based on past experience, knowledge of people, objects or situations that we have previously encountered. Schemas are therefore capable of distorting unfamiliar or unconsciously ‘unacceptable’ information to ‘fit in’ with our existing understanding or schemas. So it is easy to understand how we can go from the experience of crossing to a cultural reference of what that feeling should look like, because whatever they describe ‘seeing’ it is always accompanied by feelings of ‘pure love’, ‘bliss’ and ‘going home’.